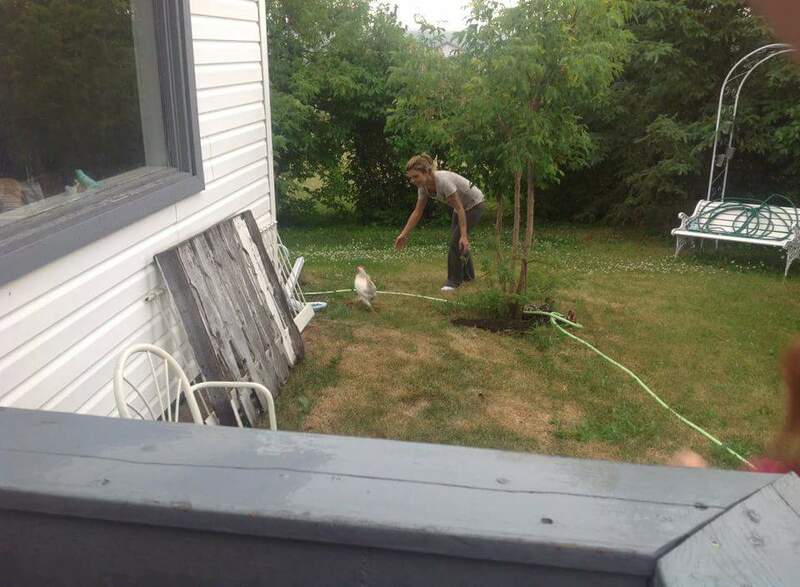 Before I begin to tell you about chicken-keeping, let me share with you a story about my first encounter with the idea. I had her in my yard while I placed an ad and asked some neighbors if they knew wherefrom she may have come. In the meantime she took shelter under my grapevine clucking and chattering probably about what an annoying fangirl I was. It turned out she had been broken out of a neighbors yard by their chihuahua and sooner than I would have liked she was gone back home to her urban condo down the road. 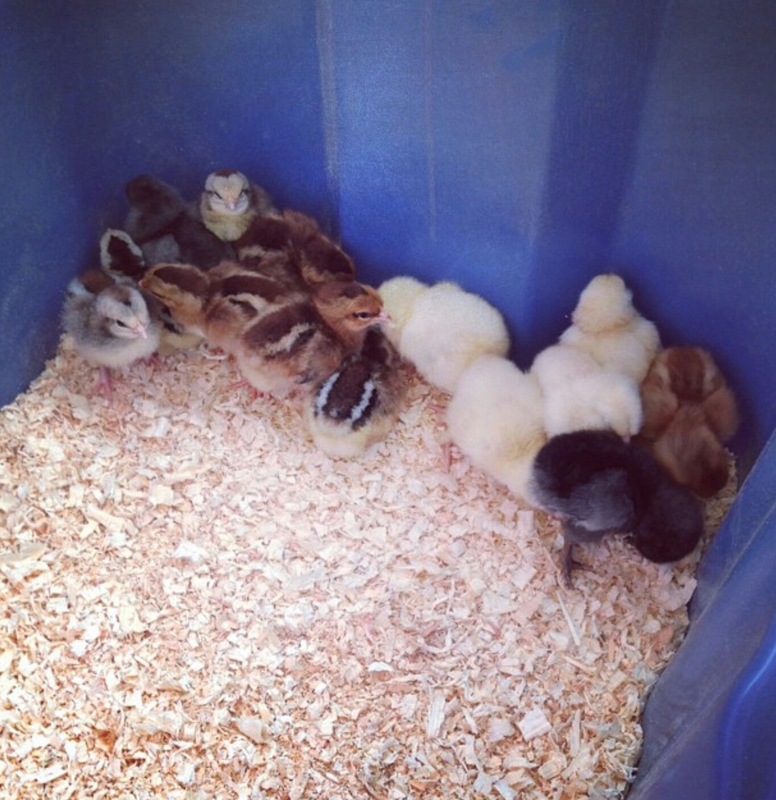 I did a little homework on bylaws and the logistics of chicken-keeping and by Easter time we got our first chicks. 14 adorable little peepers. We had Salmon Faverolles, Silver Dorkings, and Olive-Eggers. But we didnt have a coop because being true to my own form I got my chickens in a row before I put my eggs into one basket. Or whatever. 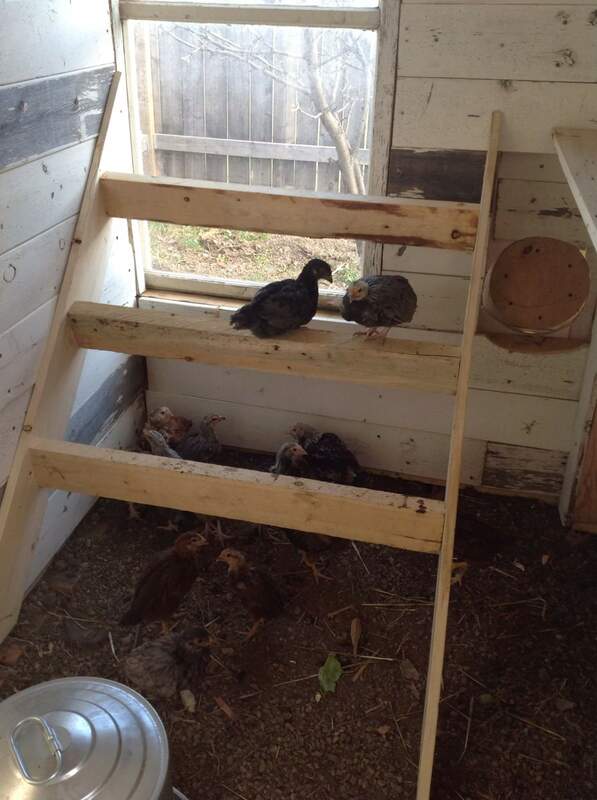 Of course after about a week of caring for them in a tupperware bin I realized the urgency of the need to build a coop so, instead of lollying around some more on the classifieds for a fitting accomodation, I got to work in the garage. 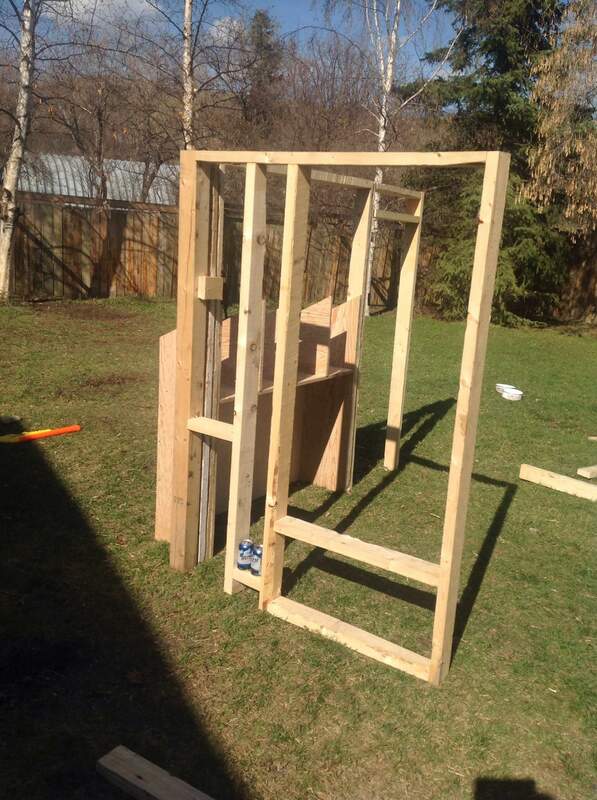 I started out by building the door first. Because I like to do things backwards, apparently. 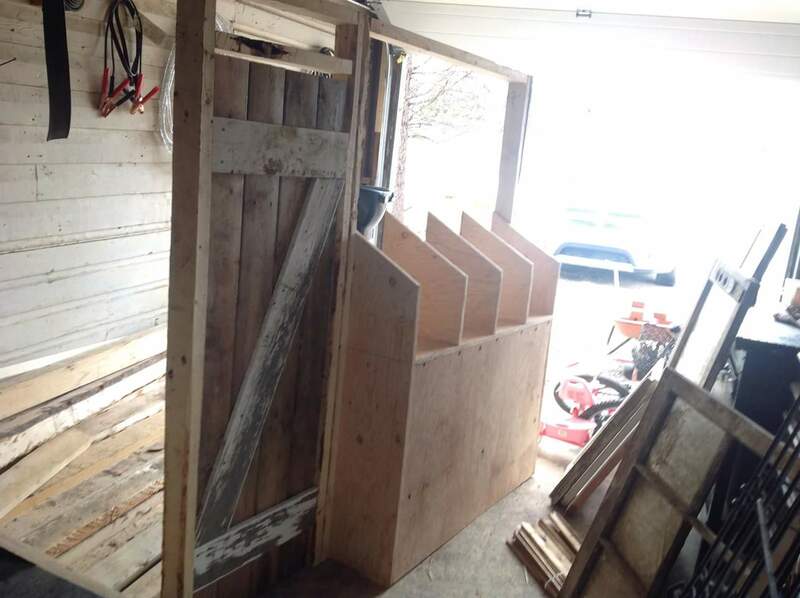 Then I built the front wall of the coop to fit the door. I made four little boxes for my little mamas to do their nesting and laying. I was really working on a whim and if I could do it again I’d have created more insulation surrounding the laying boxes. 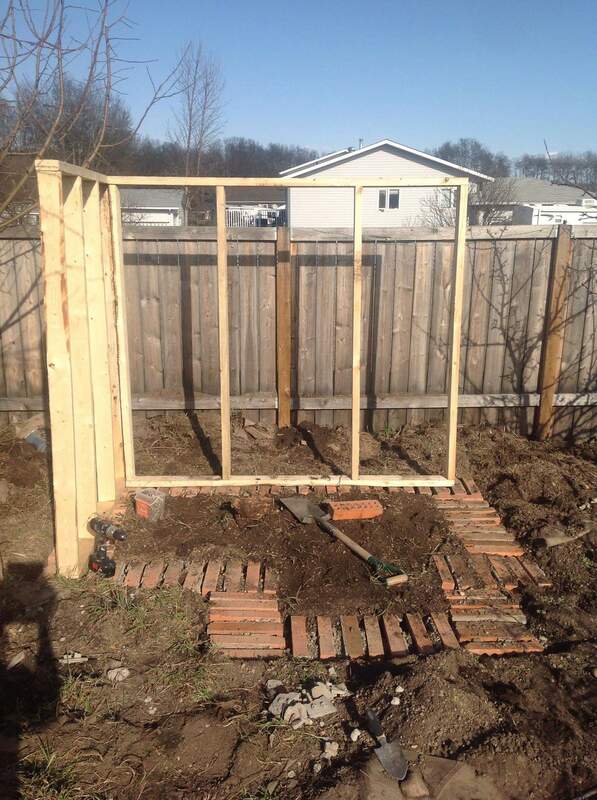 But forth I went and before long I had built a second wall. The studs are all funny because where the beer cans are placed I had originally planned to construct a solar thermal vent much like this. 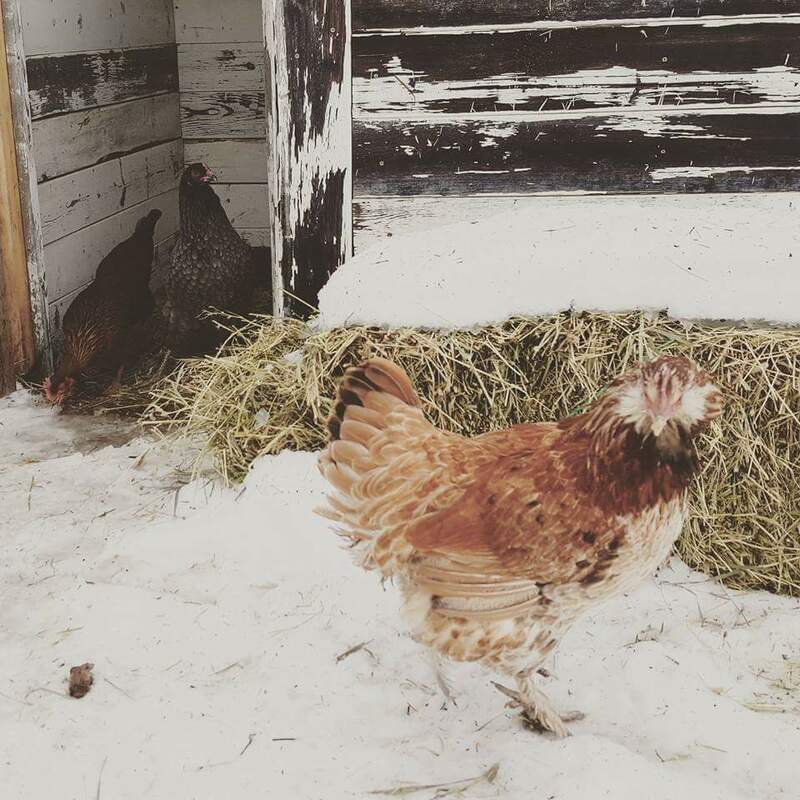 I soon rationalized that when the temperature drops to some 40° below zero celcius a popcan wall wouldn’t suffice to keep the coop warm. So the idea was scrapped later. 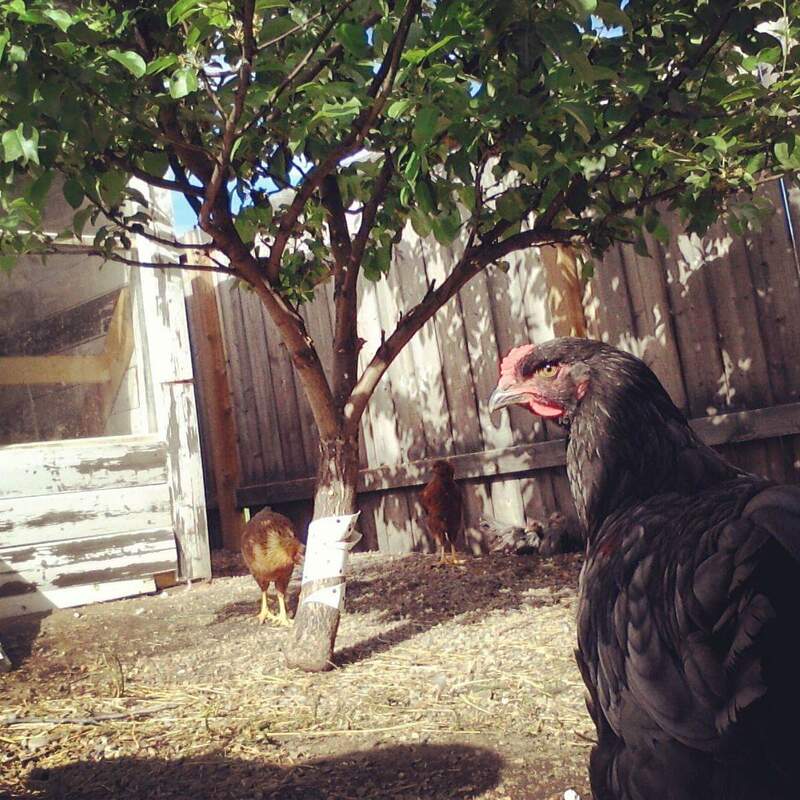 One thing I did want to do was utilize the biology of the raw earth to help process the chicken poops and kitchen scraps inside the coop. So I finished the four walls and prepared a plot. 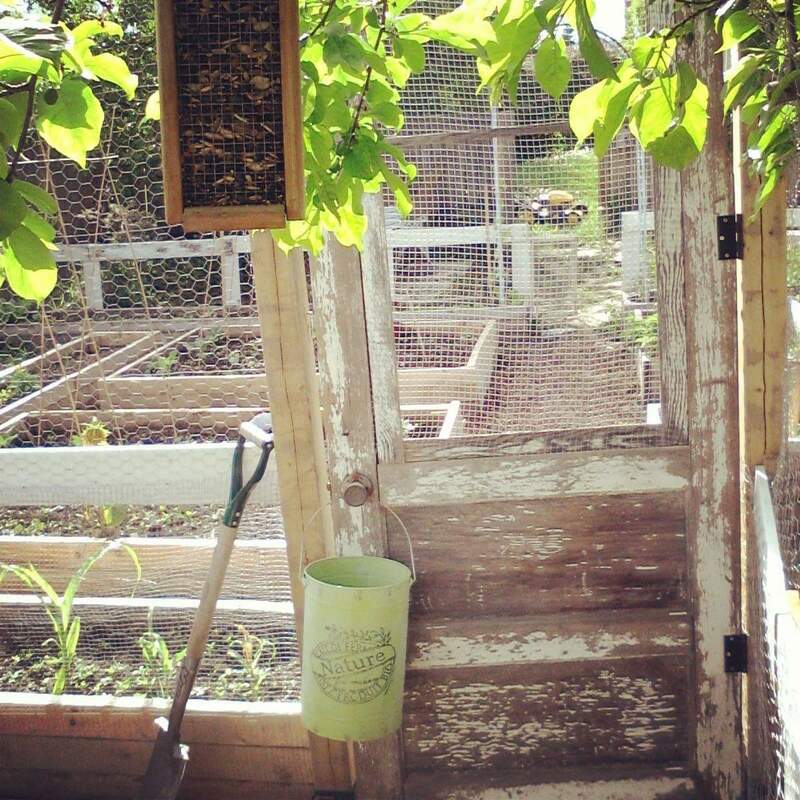 I had a stash of bricks that I salvaged from the demolition of an old hospital and I used those to create a foundation for the walls and to prevent predatory animals from being able to infiltrate the coop from below. 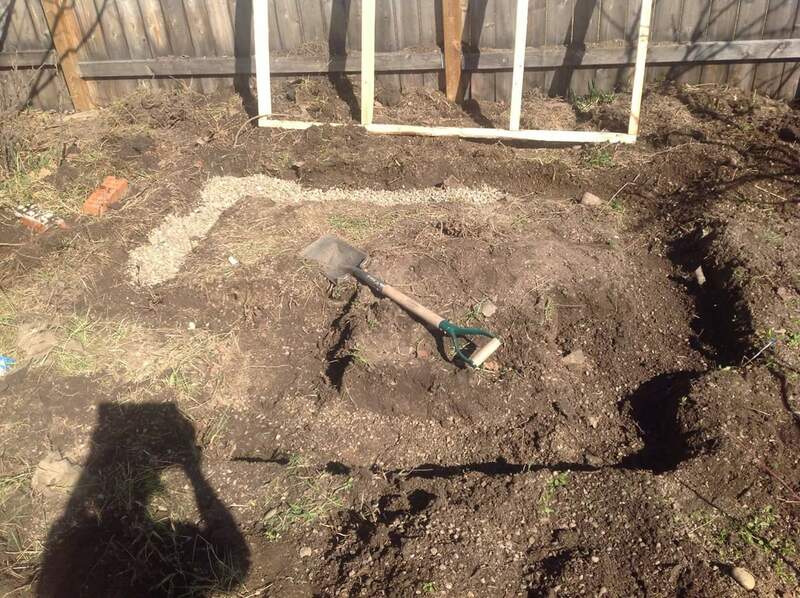 I started standing the walls in place. Who knew I’d ever need to remember Pythagoras Theory? I quickly had to relearn it in order to determine which cuts to make to achieve the appropriate roof pitch. 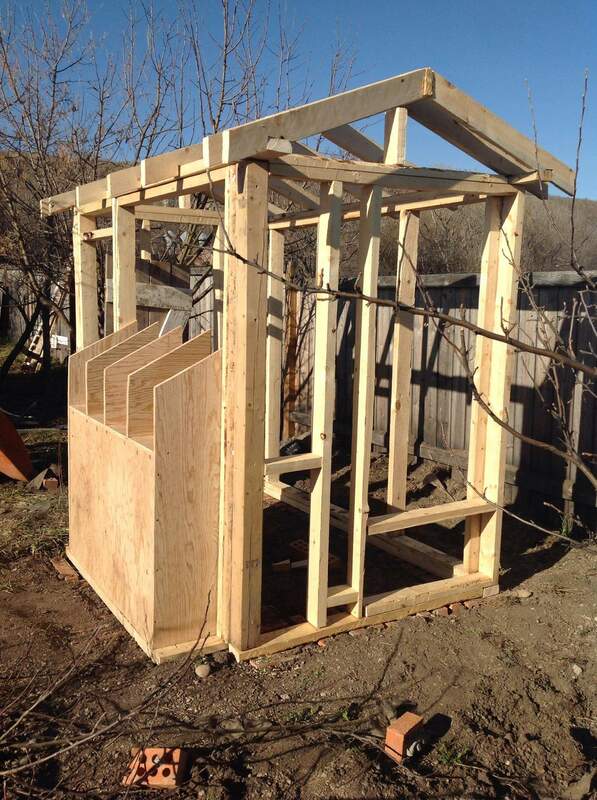 I built the roof on the ground and got help lifting it onto the coop. 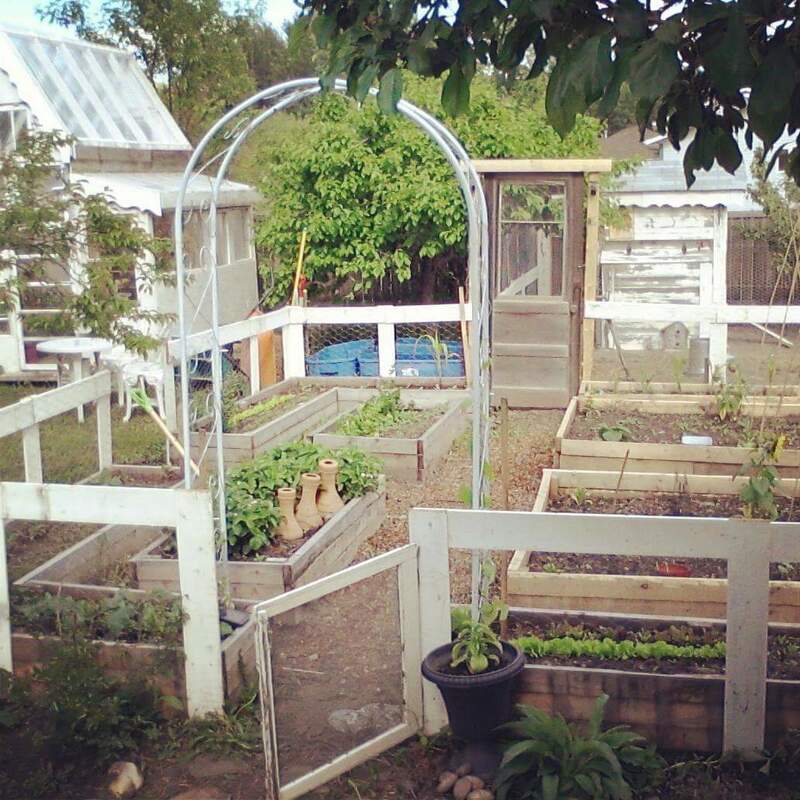 If you have read my post about the growing of my garden you’ll remember that I scored an entire discarded fence for free; and I had a lot of fenceboards, so I used them to side the coop. 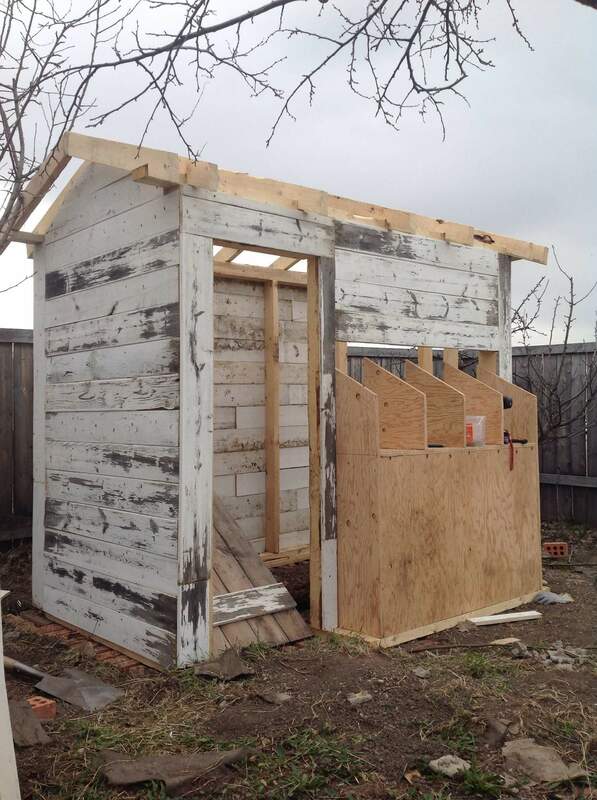 I insulated and closed the walls from the inside and threw up a roof made of plywood blanketed in asphalt paper. 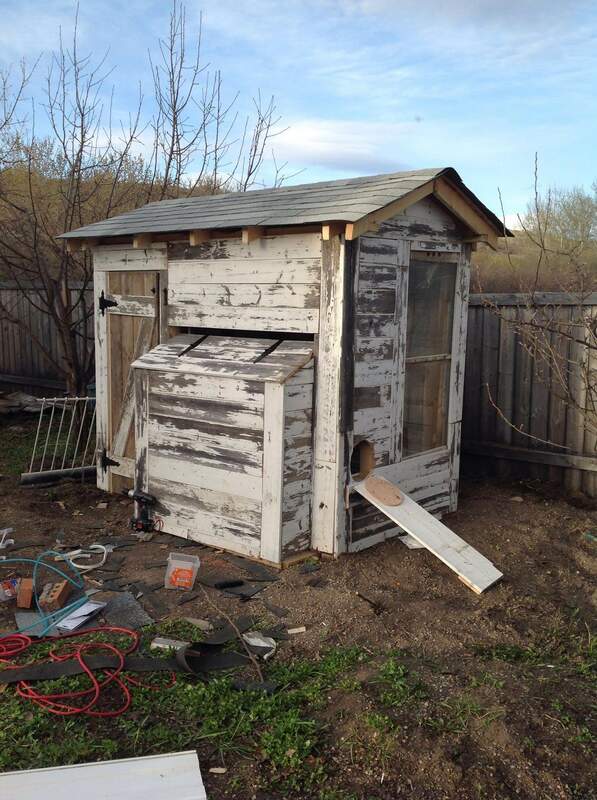 I used shingles from a neighbors’ shed reno. They seemed pretty content! Better than a blue bin at least I’m sure. 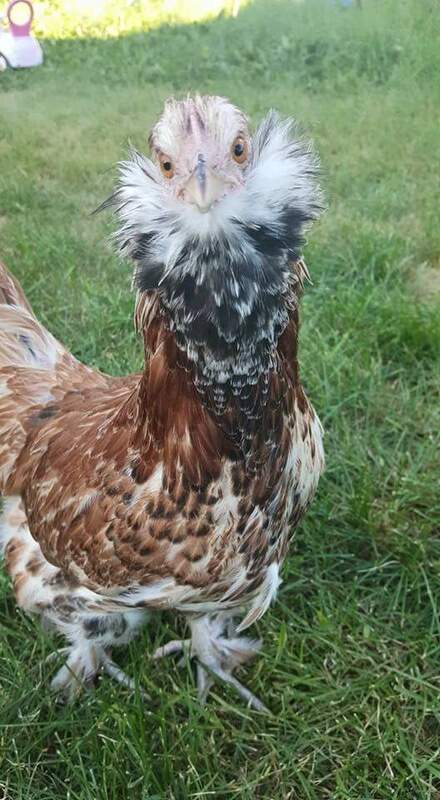 Here’s a picture of young Russel the rooster demonstrating his regalness for the camera. 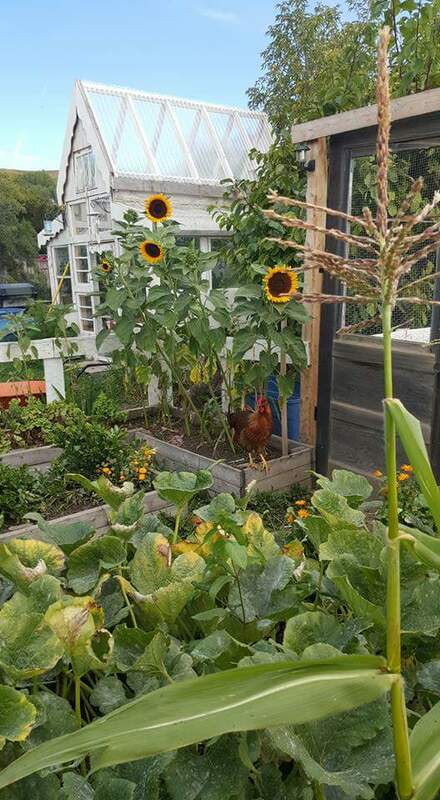 The coop is tucked in the chicken run behind the vegetable garden where the chickens are free to roam during the garden season. 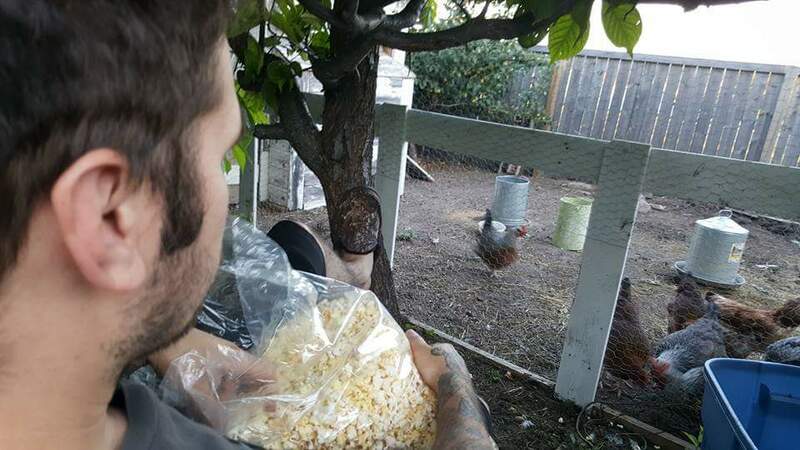 Here is my husband happily observing them while enjoying a bowl of popcorn. We are those people. 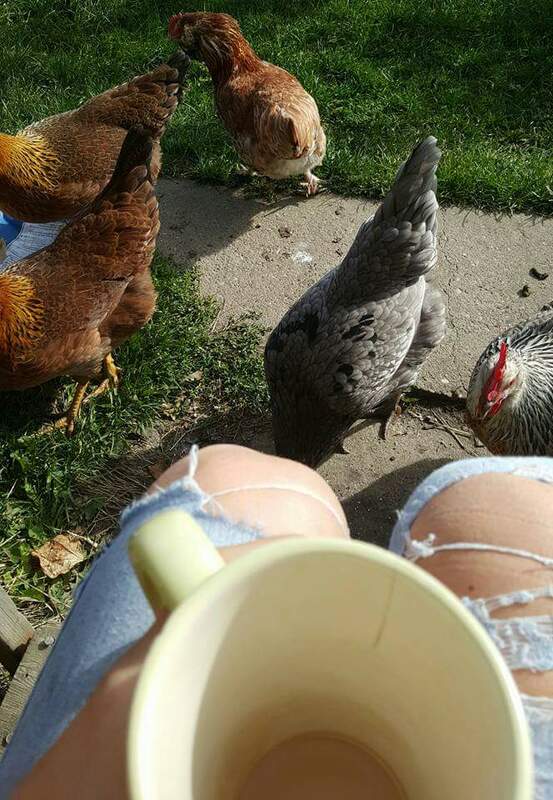 In the springtime before planting starts the door remains open and they help to prepare the garden beds with some light digging and often accompany me for morning chatter over a cup of joe. 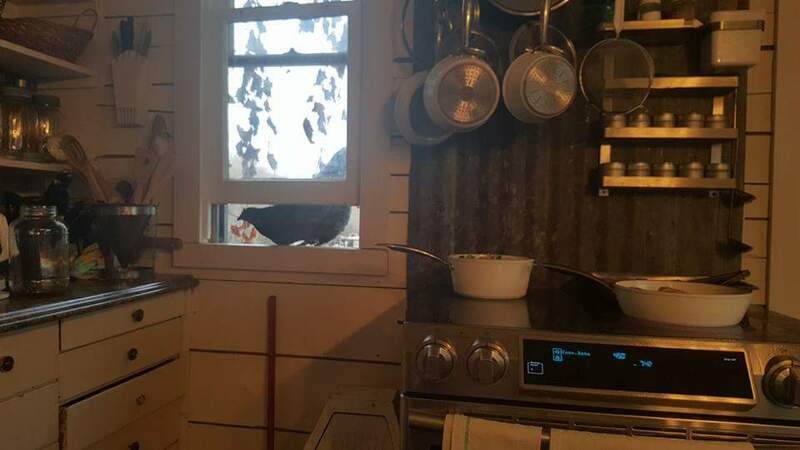 Sometimes they hop up to the window to see what I’m cookin’. 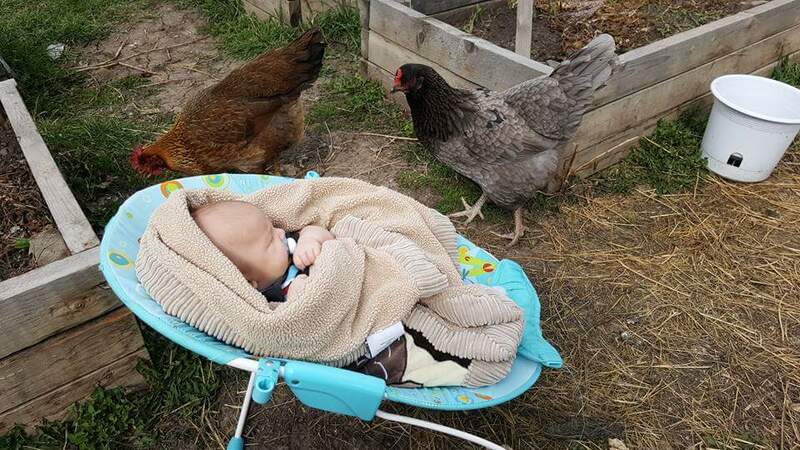 They make great babysitters too while Im doing chores in the yard. Their favorite time of the year is harvest season and they earn their keep for the winter by helping me clean up the garden beds. And then back into the coop they go for the winter, only venturing out on days when the sun offers them enough warmth to risk it! The nice thing about the raw earth floor is that it gives them something to scratch at in the winter. This is Gertrude. She my homegirl. She’s the first to welcome me when I visit the coop and is the cuddliest of the flock. She’ll literally come wiggle up under your arm and cluck sweet nothings to you for as long as you let her. 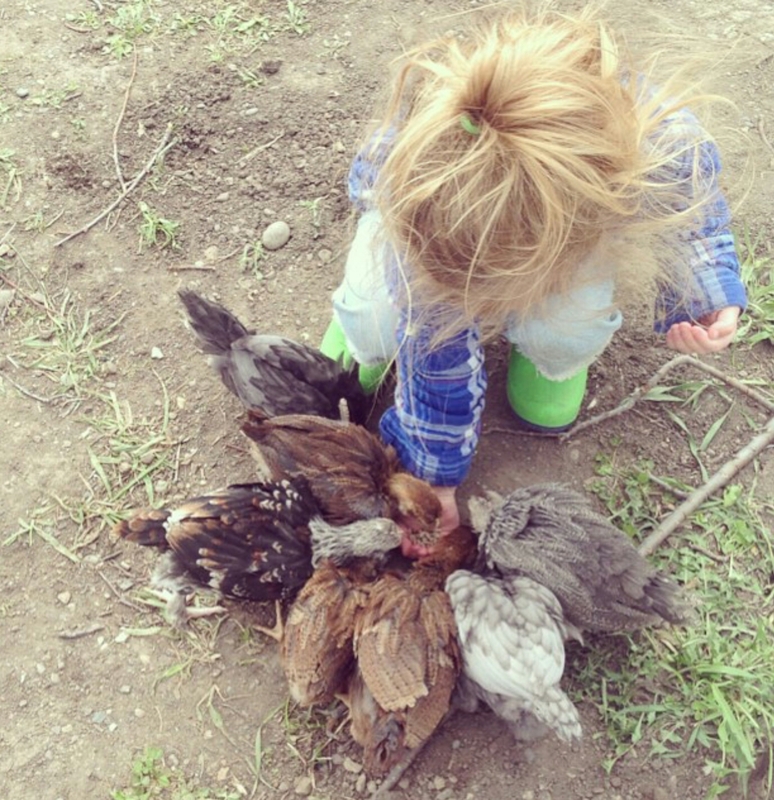 If you’ve never considered keeping chickens in your backard I think you should! They’re very loving and interesting creatures that offer friendship, eggs, compost, and garden support. And the kids really love them too! Your setup is gorgeous! Love it! Thank you, I really enjoy spending time in the garden. Pretty much my favourite place in the world! I live your creativity. You add artwork to nature! 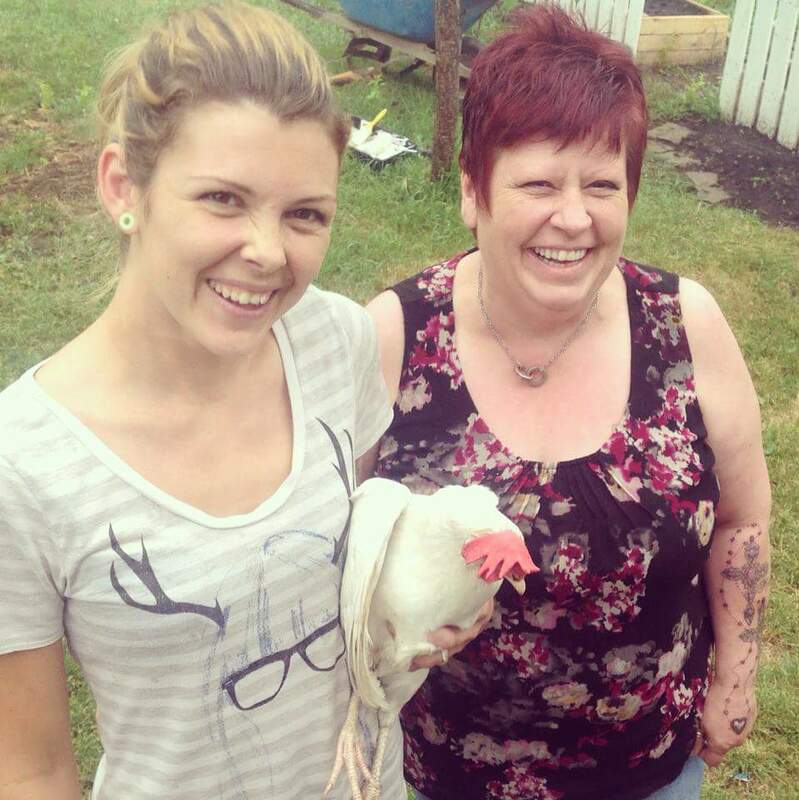 Bet your chickens think you’re a pretty cool chick yourself!